Seahorse Backpack with Rein from LittleLife (£19.99) - As soon as your little one starts toddling it is the beginning of a new adventure. Isabella started walking around her first birthday and then it was a month or so before she was confidently toddling around without any support. Their whole world seems to open up then and their desire to explore it can feel endless at times. This is where the Backpack with rein collection from LittleLife comes in because not only do toddler's like wearing such a fun backpack, but it also helps you to keep them safe while walking about. Isabella has the bee backpack from their range and she now uses as a backpack (the rein can easily be removed or reattached depending what your need is). Their collection includes popular Disney characters like Minnie Mouse, Olaf, Mickey Mouse and Buzz Lightyear, as well as animals including a giraffe, ladybird, shark, butterfly and unicorn. Each backpack comes with adjustable shoulder straps, a single detachable rein, top grab handle and internal name/address label. I'm so excited to see Poppy toddling around with this Seahorse backpack on and scarily I know it won't be long either. Strider 12 Sport Baby Balance Bike Rocker Bundle in Pink (£125) - The babies in our lives aren't left out when it comes to Strider because from 6 months up to 6 years+ they can enjoy the incredibly fun Strider 12 Sport Baby Bundle. In this set you get the bike and a rocker base, which transforms the balance bike into a rocker that can be enjoyed before your baby is even walking! Poppy has been trying it out and I couldn't believe how much she enjoyed sitting on it and rocking backwards and forward. The seat can be lowered, so your baby isn't sitting really high up and once they are too old for the rocker (it is designed to be used until they're three years old) then the balance bike comes out of the stand. It can also be easily taken in and out of the rocker if, like me, you have two children of different ages. The bike is available in pink, green, blue, red or yellow, so you can choose the perfect colour for your child. 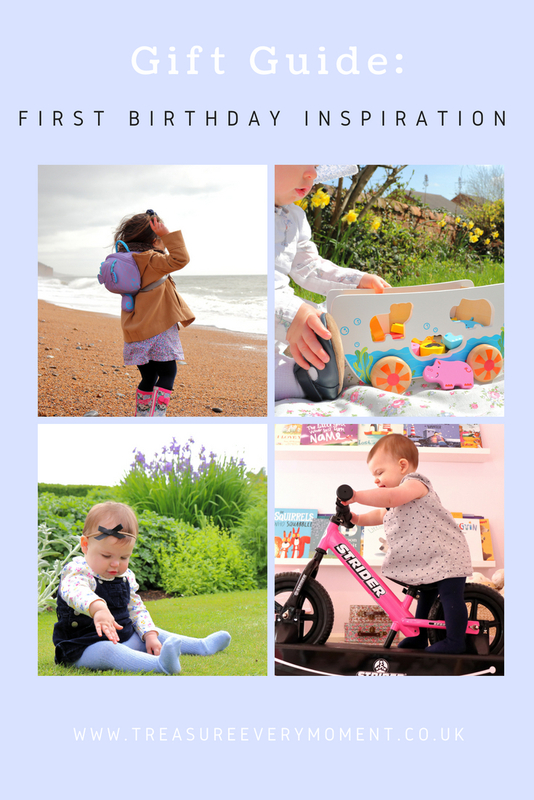 To find out more about the balance bike then head over to my blog post all about how Isabella is getting on here. Noah's Ark Playset from Hape (£22.95) - Shape sorters are a must have in my opinion because I know how many years they keep children entertained. They transform from being blocks babies can tap together to make a noise, to a shape sorter and finally to a shape identifier. It's also fun for siblings to play together with because the older children can identify the shapes while the younger ones can push them through the holes or simply gum them! Isabella loves telling Poppy the different shapes and animals on-board this Noah's Ark, whilst Poppy loves munching on the wooden animals, pulling the boat along and taking the lid on and off. Happily keeping an almost one year old and three year old entertained, which is a winner with me. I really like that this shape sorter doesn't have the standard shapes, instead animals to really test their fine motor skills. It's also a nice twist on a classic shape sorter that the Ark can be pulled along on its four wheels. Bamboo Dinner Set in the Giraffe Design from Fresk (£22.99) - By the time your little one is a year old they will probably be fully weaned and enjoying three meals a day (plus multiple snack if they're anything like Poppy), so giving them a new dinner set is the perfect gift. Fresk tableware is made from bamboo, so there's no risk of injuries and their range of designs are really cute. As well as this Giraffe design they have a Swan set, Forest Animals and Whale, which are all available as lunchboxes too. In the Dinner Set you get a plate, bowl, cup, fork and spoon, which is everything your little one needs to learn how to feed themselves. I can't promise there won't be a whole load of mess still made though! London Bus by Hape (£29.99) - If you live in London, love London or know a little one who loves spotting transport then this is the gift for them. This pull along London Bus from Hape is also a shape sorter and perfect for role play when they're a bit older. It comes with a wooden bus driver and passengers, which fit in the different shapes on the sides of the bus. Poppy loves pulling this one along, as well as munching on the chunky wooden people (no small parts is such a relief) and tipping the bus over. So, to say she hasn't got the concept yet would be fair but she's having fun and that's all that matters. All of the Hape toys are made to the highest standard, using only non-toxic materials and always with that added attention to detail. Flower and Bow Headbands from Lola Bows (from £4.25) - Lola Bows have a range of beautiful bows and floral headbands/clips that are made by hand using only the highest quality materials. All of the Lola Bows headbands are all super soft, so are nice and gentle on little heads. Their range includes almost any colour or finish you could possibly want, including 100% wool felt, floral, glitter, holographic, ribbon and faux leather. A bow for every outfit and occasion - what more could a one year old want? Personalised Guess How Much I Love You Plush Rattle from Funky Pigeon (£19.99) - Little Nutbrown Hare is one of those childhood characters that children these days will look back on fondly in years to come, so this personalised Guess How Much I Love You rattle makes the perfect gift for your little one. Funky Pigeon has a wide range of 1st Birthday Gifts, many of which can be personalised for that extra special touch, including money boxes, books, cushions, games and balloons. This really soft rattle is ideal for babies to practice their grip, as well as make music and inevitably chew when those teeth start making an appearance. Personally, I love getting the girl's gifts personalised and not only because it helps us all remember who they belong to! What would your top gift recommendation be for a one year old? Some fantastic ideas here. That bike looks amazing btw, really good build quality! My son has that Noah's ark playset and he absolutely loves it, it has been such a great gift - it's helping him learn all of his animal noises (well, at the moment he thinks everything says moo, but we're working on it!) Great ideas! The strider looks amazing - what a good idea and I love the pink colour too! What cute pics and a great list of gifts! Golly I’m trying to remember what I got mine! Definitely a backpack with a rein on them - I thought I’d get more negative comments about them but only 1 guy ever made a nasty comment in the 2 years we used them. My son loved trucks so he got one of them and I think my daughter got a toy kitten - plus lots of books and puzzles. You've got some really lovely ideas. We're huge fans of balance bikes as it got our son riding independently (without stabilisers) at the age of three. I love how the one you feature is a rocking horse first so spans a number of years! Wow, that strider bike is such a cool gift. I love that it’s on a rocker base and then as your child grows, it transforms into a balance bike. Such good value for money. Lots of unusual ideas here. For the first year you buy so much stuff that they need, it can be hard to think differently and buy stuff they just want. Oooh some great ideas here - I've heard so many people rave about balance bikes but I've never actually seen one, I'll need to have a look at getting one for H's birthday, he'd love something like this!